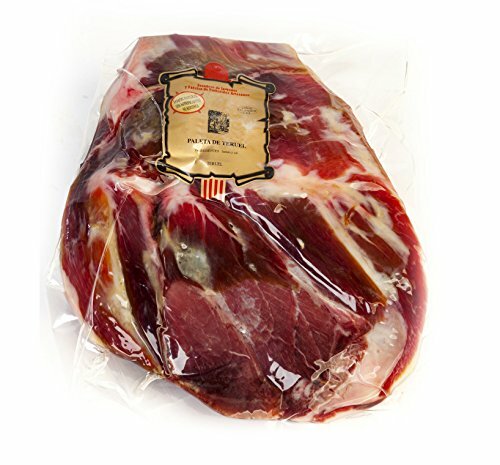 PRODUCTION: This serrano shoulder ham is produced using the most traditional process of salting and curing. It's all natural, made with Mediterranean sea salt and contains absolutely NO nitrates, nitrites, antibiotics, preservatives, artificial colouring, glucose or lactose. Minimum curation time is 20 months. Very low salt content (0.2g per 100g). CHARACTERISTICS: It presents a bright red color with a juicy texture and plenty of white marbling. On tasting we appreciate an intense aroma and flavor with an unctuous texture, leaving a long and pleasant aftertaste. 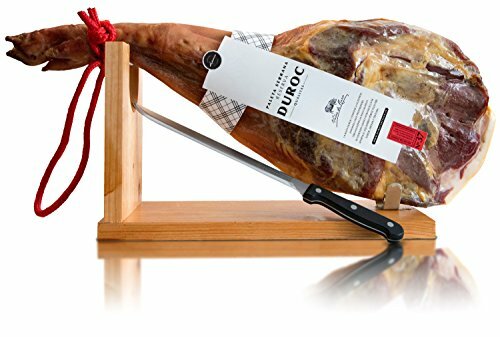 It comes from the cradle of Spanish ham, Rubielos de Mora, Teruel. STORAGE: Should be stored in a cool, dry place (preferably refrigerated) and consumed at room temperature, between 20°C and 25°C. It comes vacuum-sealed and protected by an outer carton. CONSUMPTION: Consume the product within six months of purchase. Once you have opened the package, we recommend that you consume it within six weeks, to ensure the best flavor. 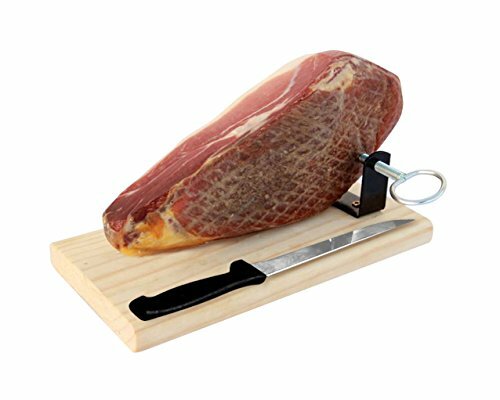 PRODUCTION: This serrano shoulder ham is produced using the most traditional process of salting and curing. It's all natural, made with Mediterranean sea salt and contains absolutely NO nitrates, nitrites, antibiotics, preservatives, artificial colouring, glucose or lactose. Minimum curation time is 20 months. Very low salt content (0.2g per 100g). CHARACTERISTICS: It presents a bright red color with a juicy texture and plenty of white marbling. On tasting we appreciate an intense aroma and flavor with an unctuous texture, leaving a long and pleasant aftertaste. It comes from the cradle of Spanish ham, Rubielos de Mora, Teruel. STORAGE: Should be stored in a cool, dry place (preferably refrigerated) and consumed at room temperature, between 20°C and 25°C. It comes vacuum-sealed and protected by an outer carton. CONSUMPTION: Consume the product within six months of purchase. Once you have opened the package, we recommend that you consume it within six weeks, to ensure the best flavor. OTHER: In Spanish, this product is called "Paleta Serrana Curada Gran Reserva Deshuesada y Pulida".